ISBN M-007-14021-2. Text language: German/English. 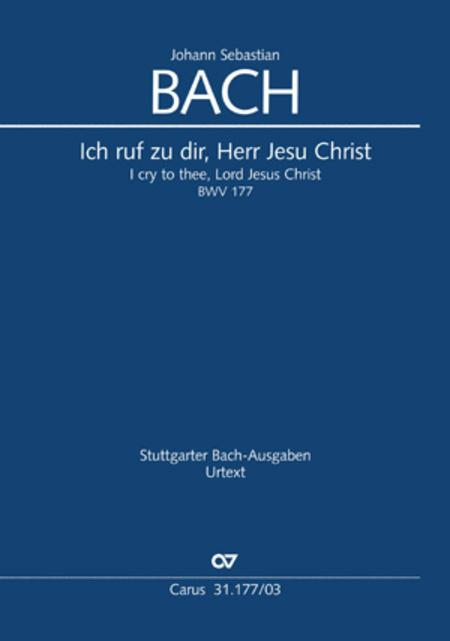 The cantata Ich ruf zu dir, Herr Jesu Christ begins with an expansive chorale arrangement, for which Bach reverted to a proven model: The four voices of the solo ensemble take over the chorale, in which the melody lies in the soprano. For stanzas 2-4 Bach chooses the aria form with a highly differentiated scoring from movement to movement, ranging from a continuo Aria (1st movement), up to an aria accompanied by the violin, with obbligato bassoon and continuo. A straightforward four-part chorale movement concludes the cantata.